The Quality and Patient Safety program at the University of Illinois Hospital & Health Sciences System (“UI Health”) supports quality and safety improvement for UI Health’s entire scope of clinical operations including our hospital, clinics, and Mile Square Health Centers. We also partner and collaborate with UIC health sciences colleges and pursue opportunities to align and integrate key quality and safety endeavors with other organizational priorities. UI Health’s Quality & Safety Strategy & Leadership Steering Committee – made up of key clinical and operational leaders from across the clinical enterprise, the Office of the Vice Chancellor for Health Affairs, and UIC’s health sciences schools – provides leadership, direction, and oversight of UI Health’s enterprise-wide quality and patient safety priorities, performance, and action plan. Directed by the Associate Vice Chancellor for Health Affairs, Quality & Patient Safety, UI Health’s Quality & Patient Safety division comprises four teams: Accreditation & Clinical Compliance, Infection Prevention & Control, Quality Performance & Improvement, and Patient Safety & Risk Management. The Accreditation & Clinical Compliance team facilitates ongoing readiness strategies to promote compliance with standards for accreditation by The Joint Commission, as well as other regulators including CMS and the Illinois Department of Public Health. 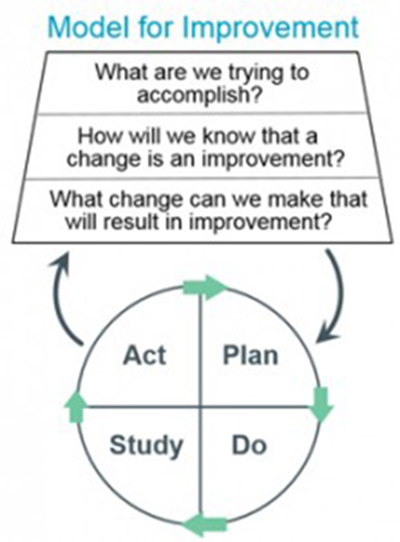 The improvement methodologies we utilize include the Model for Improvement, which focuses on setting clear and ambitious aims, identifying metrics to track improvements, and conducting rapid-cycle tests of change using the Plan-Do-Study-Act model. Collectively, we have developed and are implementing a coordinated plan to lead UI Health in consistently delivering high quality, cost effective patient care and health outcomes, and to assist in the pursuit of achieving health equity in health and healthcare.